The valley in which Lumby is situated is called White Valley, some say because of the white fog often found settled in the valley, others say it was named after George LeBlanc a French Canadian who had a mine on Cherry Creek and one of the first pioneers to settle in the area. Leblanc's business partner was Peter Bissette (also spelled Bessette) who was the first person to pre-empt land in the immediate vicinity of the present townsite of Lumby and is described by historians as the founder of the French Canadian settlement at Lumby. Since the late 1860's Lumby has had a few names including Bull Meadows, Bissit and White Valley. However in 1890 it was Louis Morand and Quinn Falkner who whould lay out the actual townsite. They decided to name the townsite after Moses Lumby the Government Agent in Vernon. For years there was speculation that Lumby convinced Quinn and Falkner to name the town in his honor in exchange for a liquor license, however historians proved this to be false as the town was named after Moses Lumby had died in 1894. It seems that Lumby was respected for his work ethic, honesty and integrity all benchmarks that still hold true in the community today. It took 25 years for Lumby to officially incorporate as a village in 1955. This land was a gathering place long before European and Asian settlers arrived in the 1800's. The Okanagan and Shuswap people gathered food and settled in this region for thousands of years. They followed the game and fish into the upper Shuswap River system, in fact both nations fished for Salmon at Shuswap Falls. Legend has it that the Coyote created the falls or the "great kettle of fish" so that he could invite all of his friends to gather for a feast and celebrate the bounty of life that this land offers. Many of the stories of these ancient people remain locked away in mystery, as stories yet to be told just like those of the first trappers, explorers and surveyors that made their way through the mountainous passes of the Monashee. Donald McIntyre was one of the first, as he bushwhacked through the dense undergrowth of narrow ravines to finally surface in a vast meadow just as a thick fog began break by a white beam of sunlight. As the story goes, the mountain landscape presented itself as the sky cleared and he dropped to his knees and exclaimed to God in his mother tongue of Gaelic "Ohed di monashied" which means "This truly is the Mountain of Peace". Today, the heavens continue to present this inspiration to both locals and visitors alike, but always within a veil of mystery. British Columbia's greatest surveyor probably would have agreed. George Dawson followed McIntyre's footsteps, or at least tried too. Mapping the new colony for Queen Victoria, Dawson tackled this vast wilderness, and lost his bearings. Taking his site points from the high vistas of the Monashee foothills and then using the Shuswap River as a reference point, Dawson attempted to track the landscape and the Shuswap River Valley; however it appears he became confused at the scattering of the many lakes that could be viewed from every vista that he climbed. Many of the lakes looked the same. On his map, which became the official map of the new colony, Dawson had missed Mabel Lake, mistaking it for Shuswap Lake. Some say the error caused many a prospector and settler to believe that the Cherry Creek Goldfields were located near the present site of Enderby, a 100 mile error of location, and for sure, no gold. In fact Mabel Lake and it's valley became a mysterious lost valley off the map which may be the reason why the valley remains sparsely populated and a pristine part of the Okanagan to this day. Dawson's error on the Shuswap didn't prevent prospectors and settlers from navigating White Valley from the Okanagan from the present site of Vernon, but cautious of the Bull Moose that called the misty valley home where Lumby is located today. Lumby's first store was built in 1891 by Harry Seed, Presently the eastern part of the downtown. After the town site was surveyed the following year, the building was moved by stump pullers to a new location on Vernon Street across from the Heritage Country Kitchen and Mercantile stands now. For many years it was used as a home and cafe by Nellie and Dave Inglis. Lumby's second store was built in 1898 by Louis Morand. It was operated for awhile by Walter Woods and then sold to W.R Megaw. William Shields bought the store in 1910, which is today's Heritage Country Kitchen and Mercantile. In 1912, he built a new store which was later destroyed by a fire in 1932, then immediately built a brick structure and is the present site of the Scotiabank. The Rams Horn Hotel was originally built in 1892 by Morand but burned down within six months of opening. A second was built using the same design and sold to Tom Norris around the turn of the century. Norris operated it for about seven months then sold it to him father-in-law, Louis Christian. The third hotel, also built by Morand in 1907 and called the Morand Hotel, was located inside the Rams Horn on the west side, and both were burned along with shields store, the homes of Joe Nesbitt and Albert Murphy in the 1932 fire. The present hotel, built on the site of the Rams Horn was finished in 1934 and first operated by Harry Weeks. The first blacksmith shop in Lumby was located where the current Shearsdown's Parking Lot is located. ​Later Eli Andre set up a second shop in what in know a vacant lot north of the telephone building on Shuswap Avenue. He was bought out by Rod Chisholm in 1920, thus Chisholm became the last blacksmith in the district. Lumby's first livery stable was set up by Tommy Christien on the site of the vacant lot next to the Travel Info Centre. This was the first establishment to be converted into a motorcar garage and was operated by Ray Shaeffer and Walter Kempton. ​Paul Bassette, built and operated the first sawmill in Lumby. It was a waterwheel job and was built on the Pierre Bassette property where the Village campsite and Royals Stadium now stand. For numerous years, farming, small sawmills and railroad tie contacts were the main source on revenue for the residants of the Lumby area. When gold was discovered in 1863 on Cherry Creek and 4 years later, silver, government representatives were sent from Victoria to investigate the claims. It is through the journals of these men that first mention and description of this area are found. These men describe stopping at Col. Houghton's (now the Coldstream Ranch) and passing Bull Meadows, Blue Springs, Camel's Hump and crossing the River at Shuswap Falls. Over the next two decades, more nd more people settledin the area and in 1889 a Post Office was opened to serve White Valley, encompassing all of the Lavington-Lumby area. In 1892, Louis Morand applied to the Goverment Agent in Vernon, Moses Lumby, for a permit to build a Hotel at White Valley. To assure the issuance of that permit, he told Mr. Lumby that after surveying the new townsite he would name the town after him. With this leverage in place, the permit was forthcoming and the Ram's Horn Hotel was erected. Moses Lumby, the son of a Lincolnshire farmer, was bornin 1842 and came to BC in 1861. After several years of prospecting in the Caribou, he found himself in the Monte Creek area, where he made te acquaintance of A.L. Fortune, the first settler in Enderby, who told him of the Spallumcheen Valley. In 1869 he took up land between Enderby and Lansdowne and in later years agitated for a rail line into the Okanagan. It was due to his time, money and effort in getting capitalists and government interested in this scheme which led to the formation of the S & O Railway Co. in 1886, with Moses Lumby as its first Vice-President. Colourful murals also make up the downtown core, depicting the history and personalities of days past. 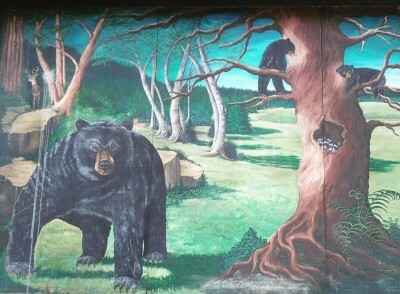 Today there are many murals in Lumby. Through them, you can view the village as it appeared in 1914 along with Louis Morand, one of our first citizens, and also one of the first homesteads in the area. There’s even a picture of Moses Lumby for whom the Village is named.